... At the call of the European Network and its associated structures, this week from 1 to 7 April (World Health Day) is marked by actions, demonstrations, conferences and debates in many European countries. It will also be an opportunity to continue the signature campaign and to join in the ongoing struggles in various countries to defend and promote a universal, high-quality, non-commercial health and social protection system accessible to all. Join us on Tuesday, April 2 ! Find here the video of the conference, organized by the National Coordination of Mareas Blancas on the "Main Model of the National Health System" on 29 January 2019, Campoamor Hall, Congress of Deputies, Madrid. In view of the accelerated destruction of primary care in accordance with the various political actions and the precepts of a mercantilist model, the coordination decided at its 8th Assembly that the time had come to remember, value and above all demand the restoration of values. primary care and its countless qualities for the satisfaction and well-being of citizens; well beyond their welfare nature. The Barcelona Declaration of the European Network against Privatization and Commercialization of Health and Social Protection, on the occasion of the meeting on 16 and 17 November 2018. The European Network calls on trade union organisations, networks, collectives and delegations in Europe to continue and intensify actions against the commodification of health and social protection and to join the European Year "For our Health" launched on 7 April 2018. 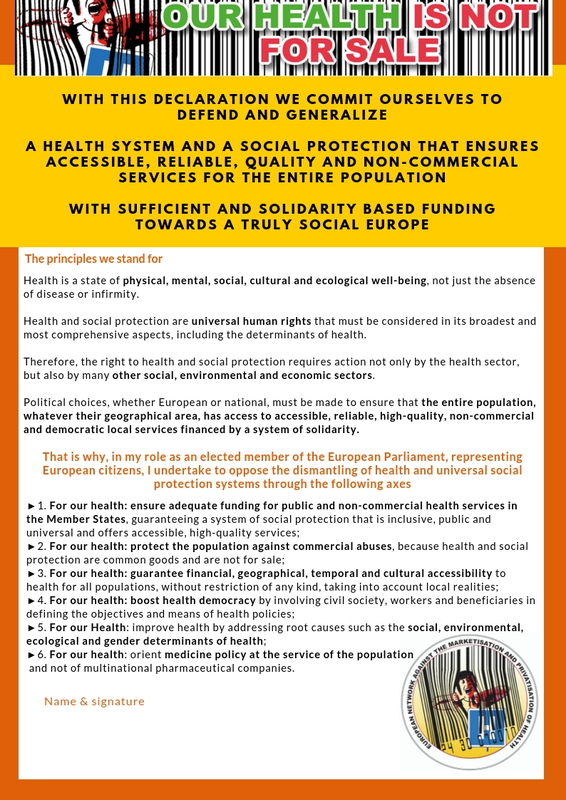 The European Network against the commercialization and privatization of health and social protection and the Belgian Platform for action on health and solidarity are supporting the European election Manifesto of the European Alliance for Responsible R&D and Affordable Medicines. EU investments need to be driven by public health needs and ensure the accessibility, availability and affordability of the R&D results. Open science, including open data and access to publications, should be adopted as standard practice. Read more about this Manifesto here! On the sidelines of the fourth People’s Health Assembly (16- 19 November 2018) in Bangladesh, activists from Spain, Greece, Croatia, Italy and the UK speak about the issues related to health in the region. The activists condemned the wave of austerity measures in the European region, which has become a major obstacle in the goal towards health for all. This article is a summary of a chapter written by the working group "Determinants of International Health" of Be-cause Health and the Belgian Platform for Action on Health and Solidarity in the "Global Health Watch 5 (GHW5)". GHW5 is the alternative report on international health of the People’s Health Movement. With a view towards the May 2019 European elections, the European Network organizes the European Health Campaign "All for health: One year to say no to the commodification of health".